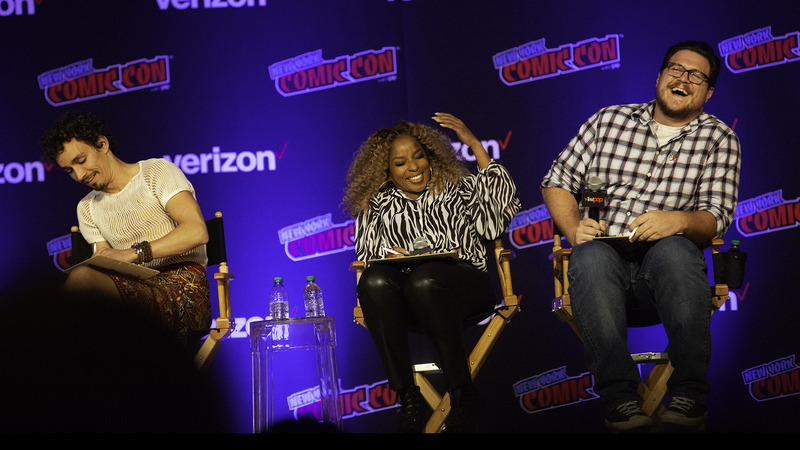 Netflix hosted Friday’s final event on the main stage of the 2018 New York City Comic Con. 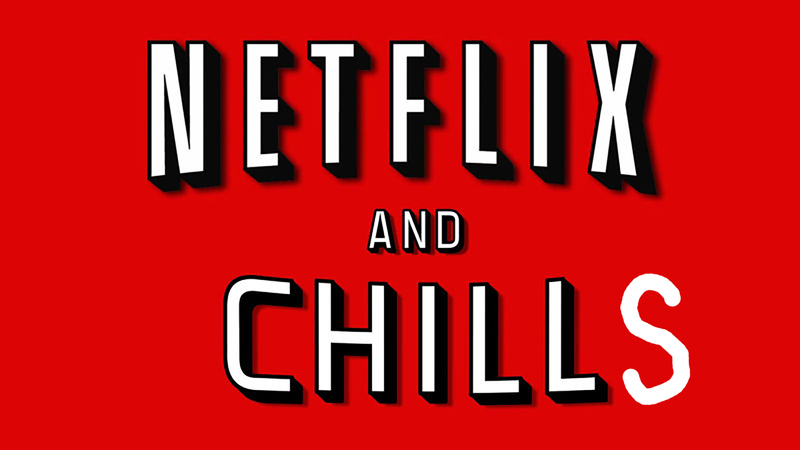 It was appropriate titled, Netflix and Chills. But as the host was quick to point out -- this was the seasonally appropriate kind of Netflix & Chills, not the teenage colloquial kind. It was a sneak peek at their forthcoming supernatural, occult, or just plain old spooky series, namely The Haunting of Hill House, The Chilling Adventures of Sabrina, Umbrella Academy, and The Dark Crystal: Age of Resistance. This one may be flying under the radar for many. It’s an adaptation of a Dark Horse limited series comic from 2007. The comic, of the same name, was (and this was my first chill of the evening) created by My Chemical Romance co-founder Gerard Way. 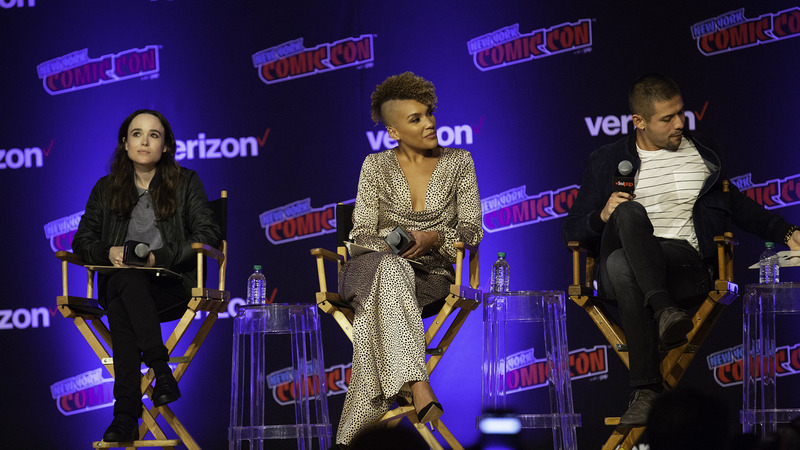 The series stars, among others, Ellen Page, Tom Hopper (Black Sails) and Mary J. Blige. The series focuses on events begun when 40 women who weren’t previously pregnant suddenly give birth to babies with superpowers. Six of these babies are taken in by a benevolent mentor to begin The Umbrella Academy, where they train to be superheroes. We didn’t see any full scenes or episodes, but the teaser they shared looked incredible (translation: dope). Page and Hopper already have nothing else to prove, and young Aidan Gallagher, who plays a 40-year-old man trapped in a young boy’s body, gave off such stage presence just giving an interview that I’m excited to see that translate into his performance onscreen. Yet, it was Mary J. Blige who, when asked to describe her character in one word, got the biggest reaction saying “Evil, evil, evil!” She elaborated that it’s “absolutely refreshing” to play the character -- she’d always wanted to play a superhero or supervillain to learn martial arts or how to shoot a gun. Umbrella Academy drops February 15. It’s not the first time The Haunting of Hill House has been adapted, but it’s the first since 1999 and also the first time they’ll actually give full title attribution to the Shirley Jackson book it’s based on (in both the 1963 and 1999 adaptations it was called, simply, The Haunting). In another first, it’s a television series, not a movie or a play. Let me be clear now: this looks scary AF (yes, we’re going to continue to beat this into the ground until no one on this site ever uses it again). During the first preview, an extended look at a standalone scene from the series, the audience was yelling at the screen long before anything scary happened, in anticipation of the moment they knew they were coming. Probably half of them were yelling at the character to “get out,” perhaps believing this to be one of these choose your own adventure series we’ve been hearing about. But the moment didn’t happen when we thought it would. It sidestepped expectations and drew out the suspense beyond breaking point. Then we got to speak to the cast, which, at least on stage, was overpowered by the amazing Carla Gugino. The series revolves around the haunting experienced by five children and their parents who’re attempting to flip a mansion (there’s always a reason that Victorian mansion is half off!) and their lives in adulthood when one of them writes a best-selling book based on the events of their childhood. Mostly, the cast gushed over director Mike Flanagan and his craft for horror, going so far as to call it Flanagan’s “horror opus.” Ensemble cast member Oliver Jackson-Cohen quipped, in dead seriousness, that when he watched the series, and he knew there was a particularly bad scare coming, it stills scared him so much that he screamed. And then he screamed again. Feeding off this promise of terror, Gugino offered that they might have another scene to share with us. The audience pleaded to see it, and the cast obliged. The lights went dark and we saw another scene. 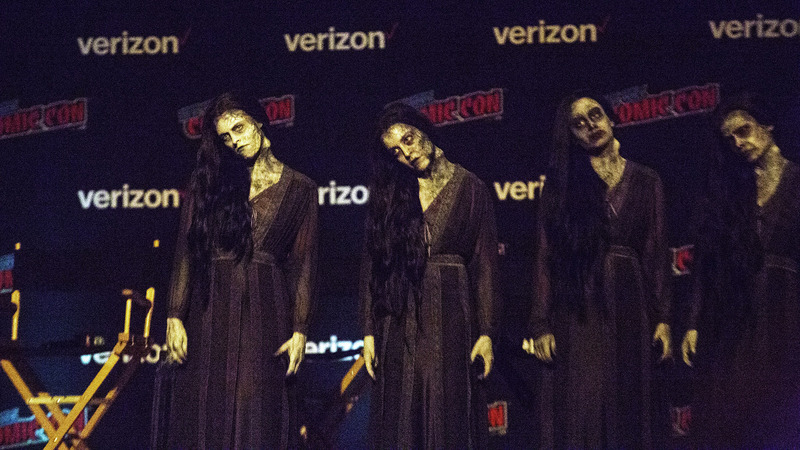 When the lights came back on, this happened, and the audience was treated to another scare in person. The series tease was that the first five episodes, or half of the season, will feature the events of the same day from a different sibling’s perspective. Presumably, the second half will focus on the adult versions of the siblings, years later. As the series is entirely puppet-based, we had on-hand, Lisa Henson, Executive Producer and daughter of franchise creator Jim Henson, as well as director Louis Leterrier. It was Leterrier who pushed the concept for the series to Henson. The series is a prequel that leads up to the events of the original 1982 film The Dark Crystal. It’s also singlehandedly the reason I had nightmares as a three-year-old. Those Skeksis be scary. Second real chill of the night. 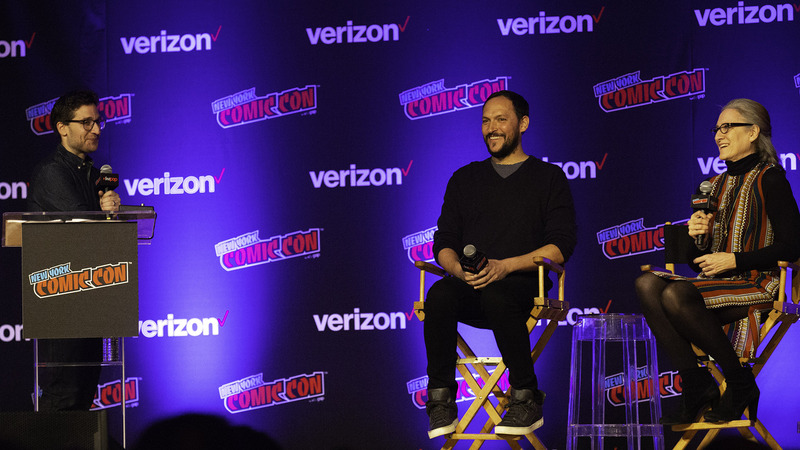 At first, Leterrier and Henson played coy, reiterating that they’d just wrapped filming “one week ago” and subsequently had nothing to share, but, as their enthusiasm for the project continued to build onstage, it was clear they had something up their sleeve. 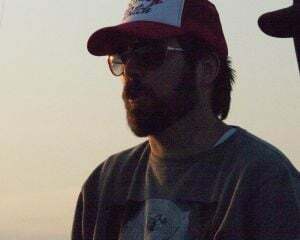 We did end up getting some behind the scenes interview footage with crew members discussing the project, and finally, new footage highlights that formed less of a teaser than a boiled down to essence taste of what’s to come. Clearly a passion project for director Leterrier, he couldn’t stop gushing about how technology, and advances in technology, didn’t influence the filmmaking. There’s no CGI. It’s all real puppeteering and real sets. What technology allowed was for the team to use green screen to remove wires and puppeteers, in effect, allowing them to do much more with the old technology than could be done in the original films. It was shot the same way and is designed to feel the same way as the originals. The audience approved this statement with a singular nod of its collective head. I’ll just say this about TCAOS, coincidentally, an anagram for TACOS, forever now known as, this also looks scary. Surely, TACOS isn’t the horror piece that The Haunting of Hill House is, but there’s no doubt it will deliver its share of bone-chilling moments. We got a preview which seemed to show this take on the ’96 ABC sitcom as a mix between the original, and something much darker -- a tone that has been widely publicized by Netflix’s marketing thus far. While there are still some wacky “aunts” in play, this Sabrina seems to bring a lot more of the witch to the series, despite the dropping of the word from the title. The preview we saw (audience members were also treated to the first episode, but critics were asked not to review) highlighted plenty of Satan and murder. Fun fact, Sabrina was originally introduced as an Archie Comics character in 1962, getting in on that witchy vibe two years before Bewitched debuted. Needless to say, Sabrina won’t be a part of the next TGIF. Sabrina gets back on her broomstick October 26.